Aussie Dives as RBA Lowe Put Rate Cut Back on Table, Dollar Reversing? Australian Dollar is again the focus in Asian session today. It drops sharply on surprised turn in RBA Governor Philip Lowe’s stance. To him, the next interest rate move is no longer more likely a hike, but evenly balanced. Aussie reversed all of yesterday’s gains and it’s now trading as the weakest one for today and the week. New Zealand and Canadian follow as second and third weakest. On the other hand, Yen is the strongest one for now, followed by Sterling and then Swiss Franc. Technically, AUD/USD’s break of 0.7180 minor support is taken as the first sign that recent rebound from 0.6722 flash crash has completed. Focus will turn to 0.7076 support for confirmation. 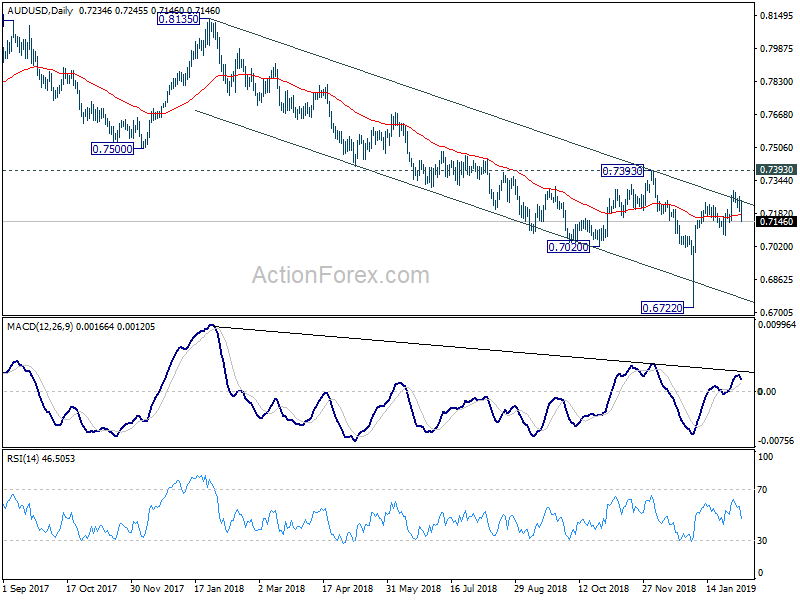 EUR/AUD also jumps today and focus will be on 1.6038 resistance to align the outlook with AUD/USD. EUR/USD’s breach of 1.1407 minor support suggests that rebound from 1.1289 has completed. Now, outlook in EUR/USD, GBP/USD, USD/CHF and AUD/USD suggests more upside in the greenback. 1.3165 minor resistance in USD/CAD will be watched to confirm the come back of Dollar. In other markets, Nikkei is closed up 0.15% at 20875.63. Japan 10-year JGB yield is down -0.0062 at -0.015, staying negative. China, Hong Kong and Singapore are still on lunar new year holiday. Overnight, DOW rose 0.68%. S&P 500 rose 0.47%. NASDAQ rose 0.74%. 100year yield dropped -0.022 to 2.702, defended 2.7 handle. It’s reported that US Trade Representative Robert Lighthizer and Treasury Secretary Steven Mnuchin will travel to Beijing for the another round of trade talks next week, following the Lunar New Year break. The scope of discussions extended beyond trade balance to intellectual property theft, forced technology transfer and China’s state own enterprises. And Lighthizer has repeatedly emphasized the word “enforcement”, regarding the implementation of the agreement. Trump is expected to meet with Chinese President Xi Jinping to seal the deal before March 1 dead line. But for now, there is no set dates for the meeting yet. In his state of Union Address, Trump said China has target US industries for their intellectual property for years. And, he emphasized the new trade deal must end trade practices, reduce our chronic trade deficit, and protect American jobs. Also, Trump announced to meet North Korean leader Kim Jong Un again in Vietnam on February 27 and 28. Germany will release factory orders in European session. Later in the day, Canada will release building permits and Ivey PMI. US will release non-farm productivity and unit labor costs. AUD/USD’s sharp fall and break of 0.7180 minor support today suggests that rebound from 0.6722 has completed at 0.7295 already. 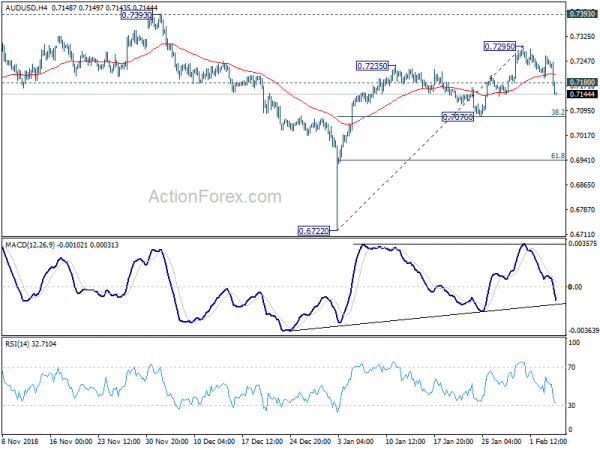 Intraday bias is turned to the downside for 0.7076 cluster support (38.2% retracement of 0.6722 to 0.7295 at 0.7076). 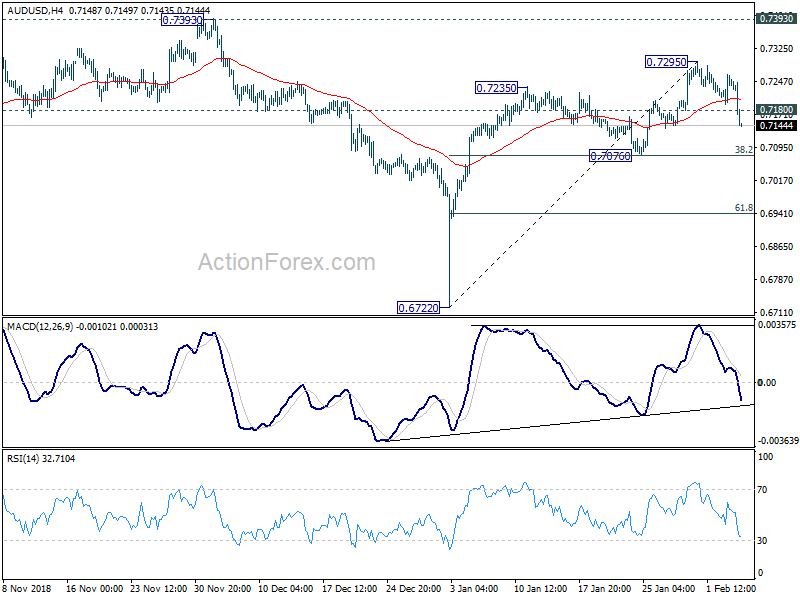 Decisive break there should confirm this bearish case and target 61.8% retracement at 0.6941 next. On the upside, break of 0.7295 will extend the rebound. but we’d expect strong resistance from 0.7393 key resistance to limit upside to complete the rebound.